Heat oven to 400°F. Line sheet pan or cookie sheet with sides with cooking parchment paper. In medium bowl, stir together flour, granulated sugar, baking powder, salt, orange peel, allspice and cinnamon. With pastry blender or fork, cut cold butter into dry ingredients until butter is size of small peas. Stir in raisins. In small bowl, beat egg and cream until well blended. Stir into flour mixture until mixture begins to come together. On clean surface, knead dough a few times until smooth. With hands, pat dough until about 1-inch thick. Use 3-inch round cutter to cut out scones; place in sheet pan. If desired, brush egg wash over tops of scones. Bake about 20 minutes or until puffed and golden brown. Cool. To make icing, stir together powdered sugar, vanilla and milk until smooth. Icing will be thick. Spoon a cross of icing onto each scone. Let stand 5 minutes before serving. It's important that the butter is cold when you add it to the dry ingredients. The little flecks of butter in the dough create the rise in the scones as they bake. If the butter is too warm, it will incorporate into the dough and you'll lose that rising power. To make an egg wash, beat 1 egg and 1 tablespoon water with whisk. Brush onto tops of scones before baking. 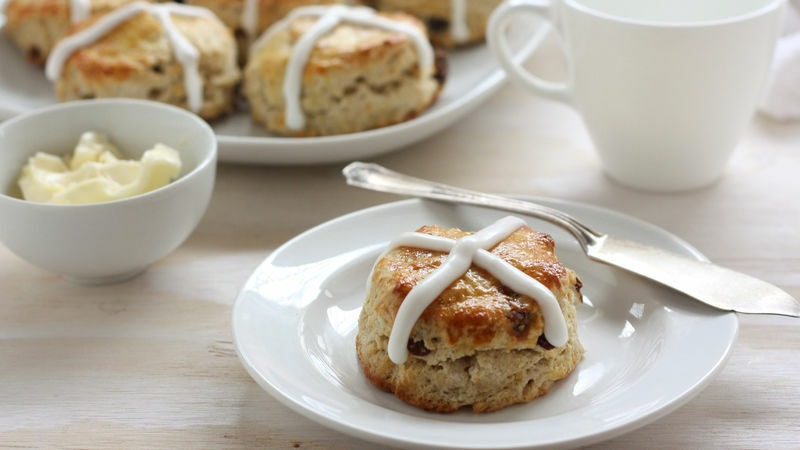 For a cleaner look, you can also use a piping bag to create the cross on the scones.